It is our nature to protect nature. As one of the world’s most prominent textile manufacturers, Kingwhale is dedicated to lowering its impact on the earth. 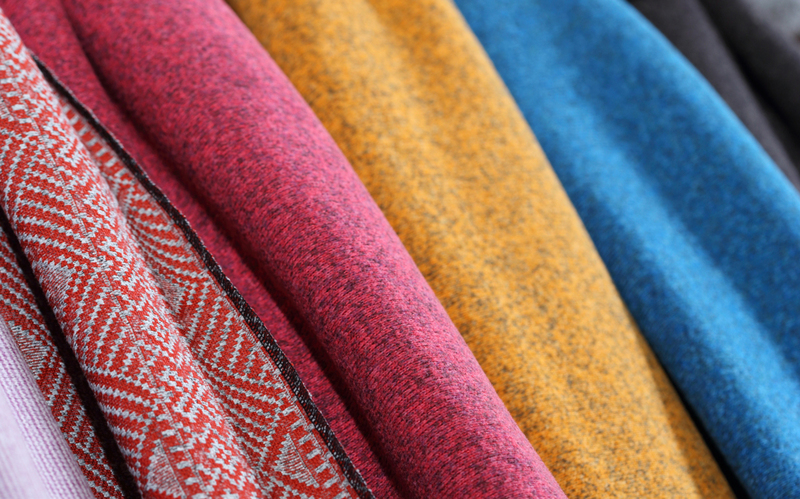 That’s because mills such as ours are instrumental in clothing a significant portion of the global population. We believe we’re beholden to something greater than ourselves. We recognize that many popular production processes today make a big impact on the earth. Textile manufacturing can be quite wasteful, relying on excess energy, water, and dyestuffs, but we also know full well that this overconsumption of resources can be avoided smartly. 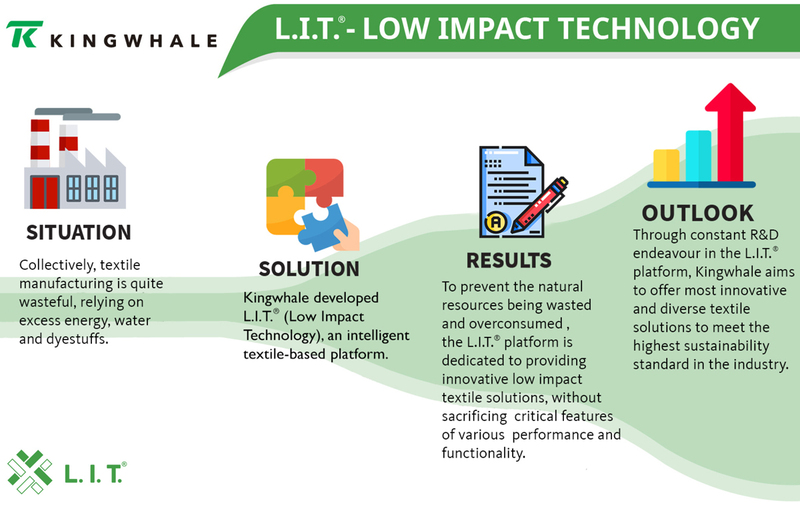 That’s why Kingwhale developed L.I.T® (Low Impact Technology), an intelligent textile-based platform. High quality performance fleece engineered by L.I.T®. Kingwhale’s L.I.T® is engineered for maximum performance while minimizing environmental impact. The production process significantly reduces environmental waste, using 60% less water, 50% less thermal energy and 22% less electricity, all the while creating a textile your consumer can count on in terms of quality and sustainability. One of our proprietary yarn technology, AlloFiber®, is an important element in achieving these results. By Changing the molecular structure of the yarn, AlloFiber® can be easily dyed at lower temperatures than conventional polyester yarn.The decremental temperature means less time and water needed in the dyeing process, resulting in less waste and less energy consumption. This eco-friendly manufacturing method is complimented by automation, digital technology and customized ERP system creating a smart eco-efficient technology platform. L.I.T® offers an optimal state in yarn production without sacrificing critical features of comfort, softness, stretch, breathability, heat transfer and durability. At Kingwhale, advancing sustainability by utilizing fewer resources doesn’t mean compromising performance integrity. Kingwhale is a leading developer of performance fabrics and garments in the global apparel industry. 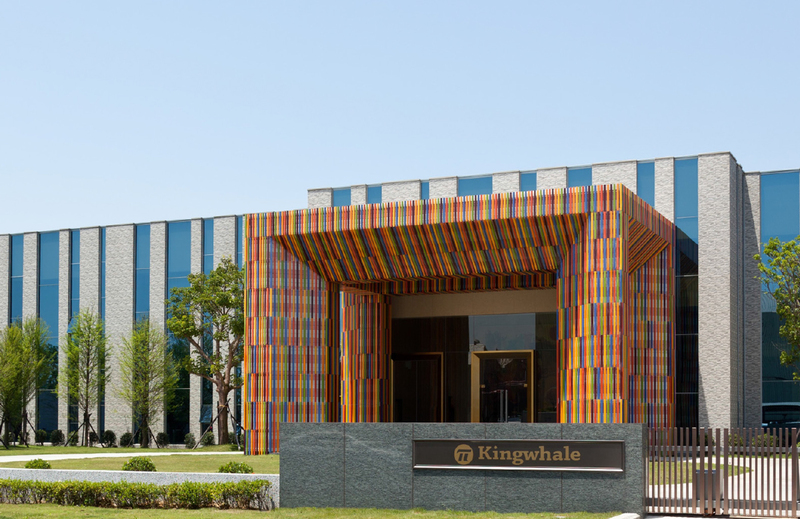 Established in 1992, Kingwhale integrates the entire production process from raw material, yarn spinning, yarn texturizing, knitting, dyeing, to the finished garment, utilizing the latest materials, machinery, technologies for diverse range of functional fabrics and outdoor/athleisure apparels. A bluesign® system partner and OEKO-TEX® certified, Kingwhale is driven by research and development to offer top quality and sustainable production in its own mills in Taiwan, US, and Vietnam. Today, Kingwhale textiles are commonly found among the most iconic fashion, performance, sportswear, and lifestyle brands. Visit our site to get in touch with our global offices across North America, Europe, and Australia.